Timeless styling, contemporary elegance and true flexibility. Maxim features strong, durable construction and a virtually seamless union of free-standing modules for an uninterrupted work surface. The Maxim Desk provides a smooth uninterrupted flow of beautiful wood surfaces. All wiring on the Maxim Desk drops neatly through top openings into wire management channels. 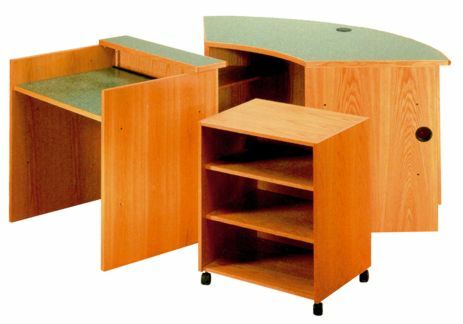 The Maxim Desk is UL-Listed, which means compliance with stringent Underwriters Laboratory safety requirements. Specialized monitor rack allows library employees to review data through a glass viewing surface while maintaining an uninterrupted work surface. Maxim ADA-Accessible patron transaction unit Maxim Mobile Pedestal cupboard unit.